Wahoo's first full cycling computer! After the first Wahoo computer, the REFLKT, it was time for something a bit “more” and with the introduction of the ELEMNT, Wahoo has done just that. 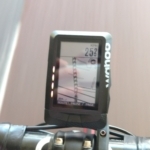 Contrary to the REFKLT, the ELEMNT isn’t a ‘dumb’ mirror of data. It’s a full fledged cycling computer. It still relies heavily on your smartphone but, after setting it up, you can actually use it completely without one. Quick Update on software here. Must read, turn by turn navigation and other fixes! I’ll update this post later to reflect the software. What’s in the box!?!? Well, the Brad Pitt of cycling computers. Stylish! The mounts, one for each bike you own. Obviously, the computer itself, some booklets you can basically dismiss and you get three mounts. One for your stem, one ‘out front’ and one for aerobars of your tri or TT bike. The Wahoo mount looks a lot like the Garmin mounts, but they are not interchangeable, so keep that in mind. But if you want something special, K-Edge has developed an out front mount with GoPro attachment and Wahoo has open sourced the mount design on GitHub. So create what you need, send it to shapeways and off you go! On to the device itself, the ELEMNT had five buttons in total. One on the left, two on the right and three on the front. The power (left) and the selector/zoom buttons (right) are a bit hard to push but that’s OK, you won’t push the computer out of the mounts. With the power button you can also control some very basic settings like pairing and searching for a sensor. The buttons on the right will allow navigating through this menu and zoom on the datapages and map. The three buttons on the front are easy to use and allow starting, pausing, stopping a recording and changing datapages. It’s all pretty intuitive if you’ve had any cycling computer before. And for most settings you are set to use your smartphone (iPhone or Android), more on this later. As for the battery life, Wahoo has classified the ELEMNT as having a maximum of 16-17hrs of battery life, this is mostly dependant on your use of the backlight and live tracking. And if you live in a moderate climate like I do, or in the tropics, you don’t have to worry about a bit of rain. With the IPX7 classification you should be good to ride under 5 feet (~1.5m) of water. If you pull this off, send me the video. 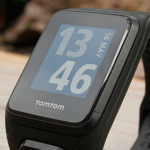 There’s a lot going on screen wise in wearables and cycling computers. Some are going colors (like the Garmin Edge 520), others are going with eInk. Both have advantages and disadvantages, where colors are nice and add for more detail and information where eInk adds a lot on visibility in the sun and saves buckets on the battery. 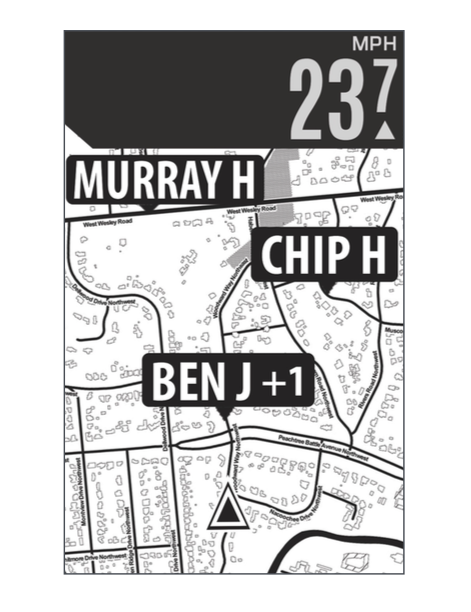 Wahoo went with eInk on the ELEMNT and made a good effort on it. The screen is 2.7″ (68.6mm) and has a 240 by 400 pixels resolution, which is just a bit too low to display street names, but with the easy zooming in and out I have not had an issue with that. The absolute bonus of eInk is that it is crystal clear and has a very high contrast so visibility is excellent. The screen itself is not touch screen, which I personally like as you won’t have problems when you find yourself in some rain. The datapages are … interesting. The ELEMNT has some pre set for you which cover the basics and you can control these and add or swap information as you desire, using the app on your phone. The interesting part is how the datapages are displayed. Using the up and down buttons on the side you can ‘zoom’ on the datapage. Basically you go from 10 to 1 field of data and the numbers get bigger and bigger (or from 1 to 10 and they get smaller….). One of the datapages is specifically for climbing and is nice if you live near the mountains. I quickly disabled it as the Netherlands is as flat as a pancake and the biggest climb I have is about 6 meters on a bridge over a canal. You also get a ‘map’ page with about every know road on the planet. Needless to say, the Wahoo ELEMNT should work flawlessly with the Wahoo KICKR & SNAP. After you’ve paired it, you get a bonus datapage for controlling the device. 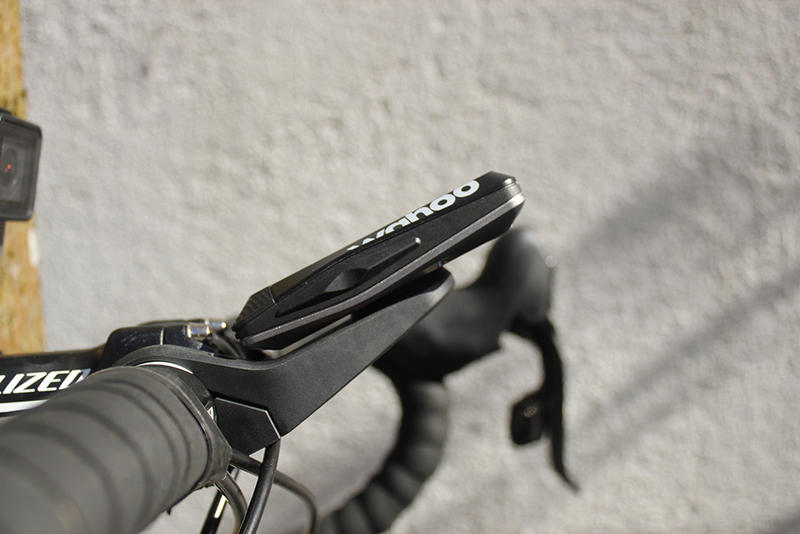 As you’ll have noticed the ELEMNT has some neat looking led arrays on the side and top of the screen. And thankfully, you can control what they indicate. This serves some purpose when you’re riding a route. 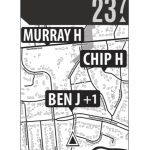 As routing has no turn indication, you’ll probably want the map page to be your main page, as not to get lost. With the LED’s set to HR you can keep an eye on what zone you’re cycling in. With the infamous Dutch winds it’s easy to go way too intense and having the side leds on ‘three greens’ means you’re in Z3 (of 5). So you can quickly see what HR zone you’re in and crank it up, or tone it down. The slightly blurry picture here was taken during a ride, you can see the four leds being pink/orange-ish. If it goes up to five they’ll go bright red and two is blue. The excitement of using the ELEMNT has caused me never to see one LED so I don’t know it’s color. 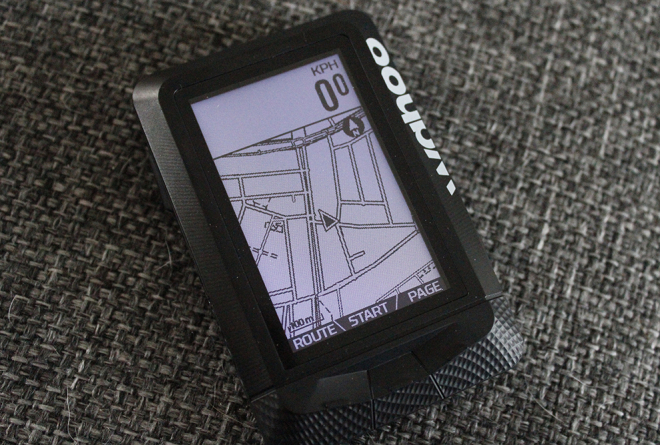 The Wahoo ELEMNT comes prepacked with detailed cycling maps. I asked Wahoo if there was any localisation done, but to my surprise there isn’t. Which basically means they jammed the whole world in there. Now I’ve taken it out and sure it covers my country and some others of which I know. And I enquired how detailed it was, to which a Wahoo Dev has told me he put every road, bike path and footpath and jammed it on the ELEMNT. All in all a whopping 30Gb. For as far as I can tell, he did an amazing job, the smallest roads I know are on there and even most private ones. With the latest update you get control of which maps you want to have. You can get a map for (as far as I can tell) every country. 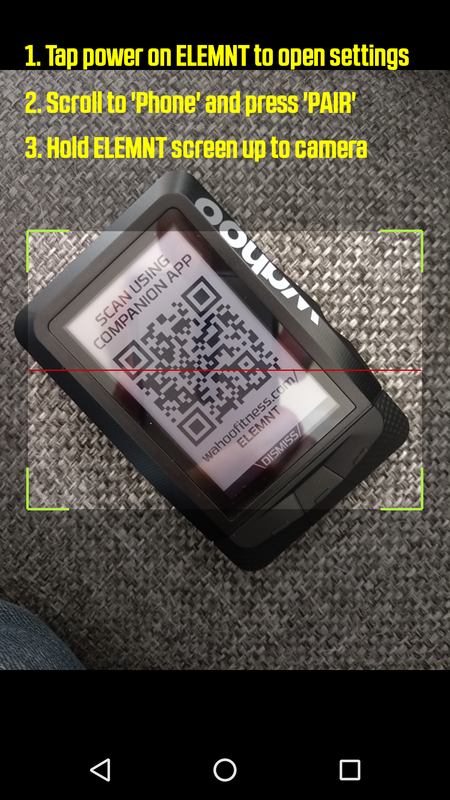 It’s very simply done on the ELEMNT companion app. You get some pre installed, but if you live in Japan, you might want to download that region. or on existing countries, easily free up space. So, after that, you’re good to go! Oh and don’t worry about lengthy updates, the files are compressed and updated incremental so you don’t really have to worry about data as only the changes are send over. There are camps in navigation with maps, the people who keep their maps with north facing north, people who turn their maps as they go and people who get in their maps. So to accommodate your preferences you can set whether or not the map rotates in with a simple switch in the app. A nice feature is that you can see your friends on the map. Currently this only works with the ELEMNT if your friends have one too, but there’s talks to add it to the phone app as stand alone so you can see your friends. When activated you can see indicators of where your friends are. This is really neat if you’re in a group that got split up or everybody is doing a big climb. No more guessing if the friend with the thunder thighs is catching up, or if you are making everyone wait. This information requires your phone with active data connection, and as I don’t have any friends, you’ll have to do with the stock photo. Anoter nice addition is the support of routing. In cooperation with RideWithGPS you can create simple breadcrumb routes. You can also use other tools, like Komoot or an old ride as it’s based on GPX files, which you can even pull from Strava if you’d want to. The current status is purely breadcrumbs on the map, but Wahoo is known (at least to me) to actively improve their products and in this case there should be an update coming out that will support turn-by-turn notifications. So you can just ride and not have to keep an eye on the map page. This is a great addition if you go to unknown areas, you can map out a ride and not worry about getting lost. Creating a route is dead easy. Authorize RideWithGPS and you can see your saved routes in the companion app. They automatically sync to the ELEMNT where you can pick to ride them. In the app, you can find routes in your profile. A short ride I created to celebrate our liberation day. 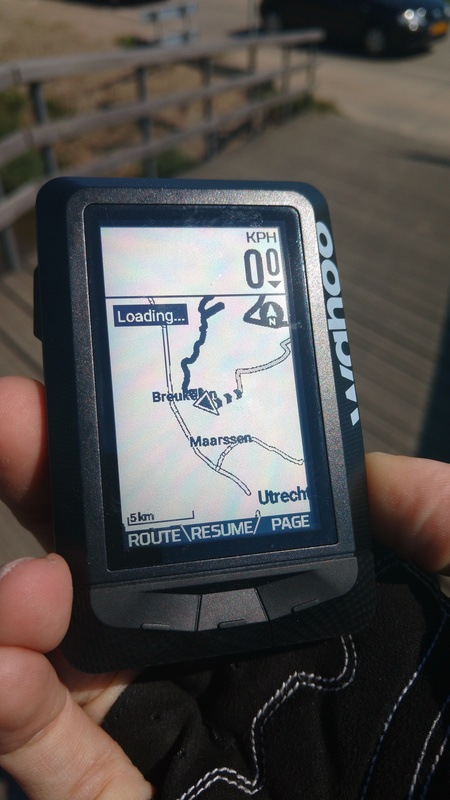 On the ELEMNT you will see a breadcrumb, I’d advise to stay in the biggest or 2nd biggest zoom level to make sure you know where to go. I was riding a route in a know area an got confused if I had to turn left (and made a mistake planning the route) or take the next left. Once I zoomed to the lowest level it’s perfectly clear. The only thing missing here is the ability to actually delete a route if you don’t want it anymore.It’s not like they take heaps of space on the device, but I’m sure it will come soon. I zoomed out the map so you can see my trail and the chevrons on where to go. 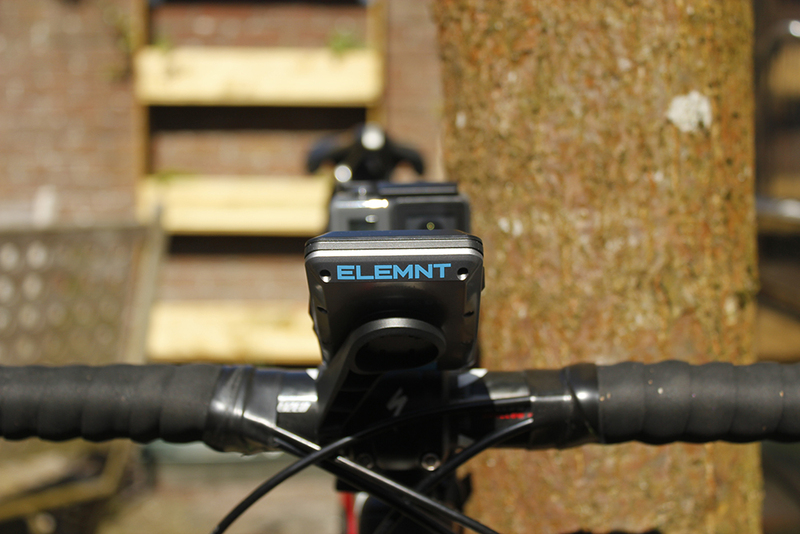 If you veer off the route, the ELEMNT will blink all it’s top LEDs bright red to notify you. This will stop after a minute or so. It’s quite strict on this, just 10 meters off course will trigger it. I saw it a couple of times during my rides, but only when I actually went of the planned route. And because it stops it’s a great feature. The companion app allows the ELEMNT to directly upload your files to other, wider used, websites. 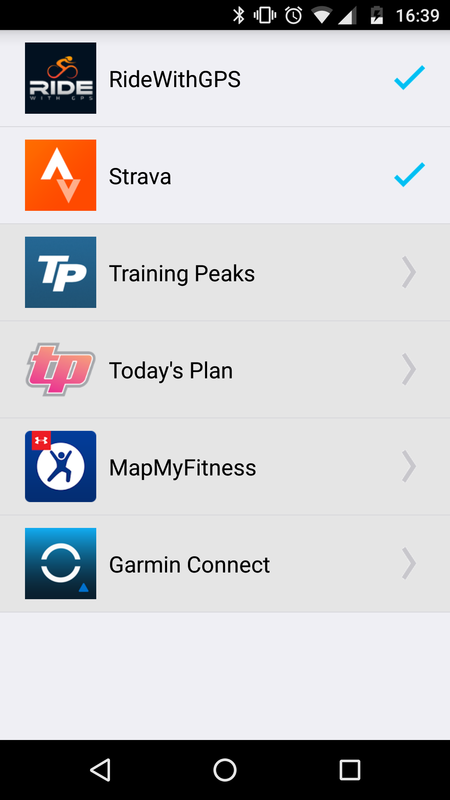 The list: Strava, Training Peaks, Ride With GPS, Today’s Plan, MapMyFitness and even Garmin. 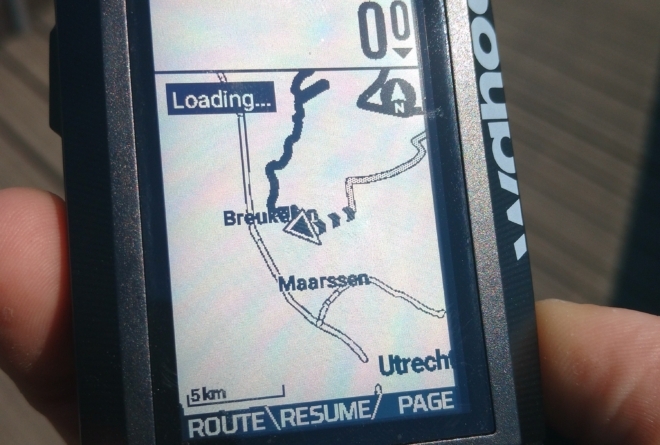 You can enable direct upload from the device if you want, that way, after every ride, once you come close to your WiFi the ELEMNT will connect and automatically upload. So, even though it relies heavily on your phone, you don’t need it to synchronise! Wahoo is also working on incorporating live segments. The details on on this are to be announced, but it was scheduled for this month (May ’16). The ELEMNT has built in ANT+, Bluetooth and WiFi. So it can probably read any of your current sensors, it even supports the new BSX Insight SmO2 sensor and Shimano Di2 gear status. 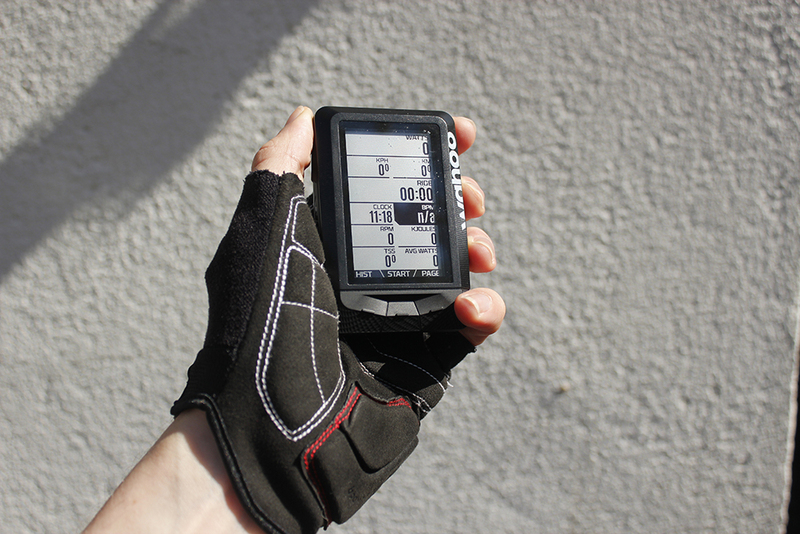 Plus, you can even use Di2 buttons to change pages or zoom on the ELEMNT. The built-in WiFi is used so it can connect to your home WiFi by itself and synchronise the data of your ride automatically to the apps I’ve mentioned earlier. So overall, it’s clear what it does and connects to just about anything. The ELEMNT relies heavily on your smartphone. This was part of the whole design process. We live with our phones glued to our hands nowadays, and phones have this nice, very well working touch screen. 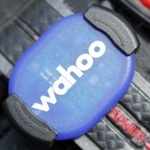 So Wahoo put two and two together and basically made your smartphone the center of control. During a ride you don’t need your phone at all (as in: you can leave it at home if you want), you can change some basic settings on the ELEMNT itself, but if you want to change datapages and such, you should bring it. Changing datapages and settings using your phone is simple. 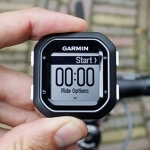 The app shows your latest rides and in the settings you can set the settings of the ELEMNT. You can easily add pages and on the pages control what data is displayed and in what order with a maximum of 10 fields per page. If you want more, you can create extra pages. I recommend changing this with your device on and on the page you’re working at, as you will see the changes appear live on your device. This is pretty neat, no synchronisation step or anything. When you make a change, the ELEMNT instantly picks it up. Oh dear, the pairing. This was such an easy process, I almost forgot to add it to this review. And also the first time I’ve found QR codes useful! The pairing process is so easy. 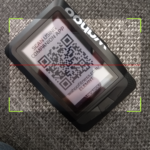 Once you start your ELEMNT for the first time it will present a QR code. And once you start your app the first time it will want to pair, and scan a QR code. Use your phone to scan the code and done. I’ve tested this a couple of times and it took between 2 and 10 seconds for me to pair it up. Paired with the app, you can also get smart notifications. Either texts or incoming calls, or neither. I tend to have incoming calls on, as I can see who’s calling. If it’s #thegirl, she knows I’m out, something must be up. If it’s a debt collector I’ll just ignore it as usual. So Wahoo has made a first step in cycling computers (after the REFLKT) and I have to say they’ve done an amazing job. It’s a straight competitor for Garmin and Polar now. But as with every device something is missing. The first thing that comes to mind is workout support. 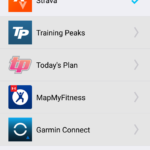 Where on Garmin, Polar and Suunto etc.. you can create workouts. Sync to the device, head out for a set and have your computer tell you what to do; slow down, speed up, etc. This is not available on the ELEMNT. Not a big problem, I don’t think it’s a feature the majority of users want or use, and who knows, maybe in a software update it will be added? Another small issue I have is the intuitivity of the datapage settings on the app. I am terrible at setting datapages and the App doesn’t really help as it confused me, however, chatting with a Wahoo Rep, we came up with a great idea so hopefully a new layout will be implemented. But if you keep the device close you can see your changes straight on the device so again, no biggy. I know Wahoo is very good with listening and responding to their audience so who knows! Overall I think the ELEMNT is a quite well rounded device and the move to have your phone as a key controller feels like a logical step. It is fun to ride with, the screen has amazing clarity and readability. Even with 10 fields on the display it’s easy to see the numbers. 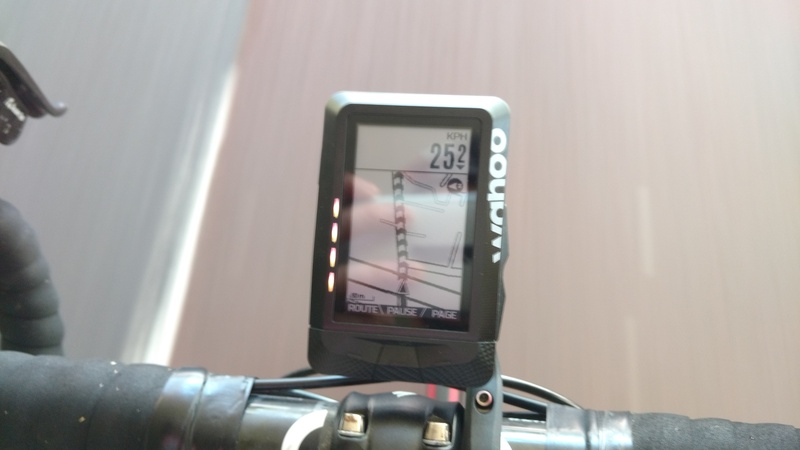 The Wahoo ELEMNT comes in two options, the stand alone computer which currently sells for $329 on Amazon and as a bundle with a TICKR, and a speed, and a cadence sensor. This currently sells for $430 on Wahoo. Thank you for reading and if you like my reviews and would like to buy the Wahoo, please use one of the price links or buy via a banner on the sidebar. I get a small fee for your purchase which helps me maintain this website. Wahoo JUST NOW (I got the e-mail five minutes after my post) released a firmware update for the ELEMNT with some new stuff. So I’m adding more information to this review in the upcoming days, stay tuned!